Onrush is a game that I really enjoyed playing in beta form a few weeks back, and also a game that I have kept my little eye on leading up to release. I tend to not really be a big racing guy when it comes to my video games, with anything that requires a decent skill set in regards to turning a tight corner normally ending with me implanted into the closest scenery. Onrush loves throwing you into such things luckily, so already we were a match made in heaven. Onrush takes a few things from other racers and even certain objective-based shooters out there, mixes them all together and makes something very unique on the market right now. 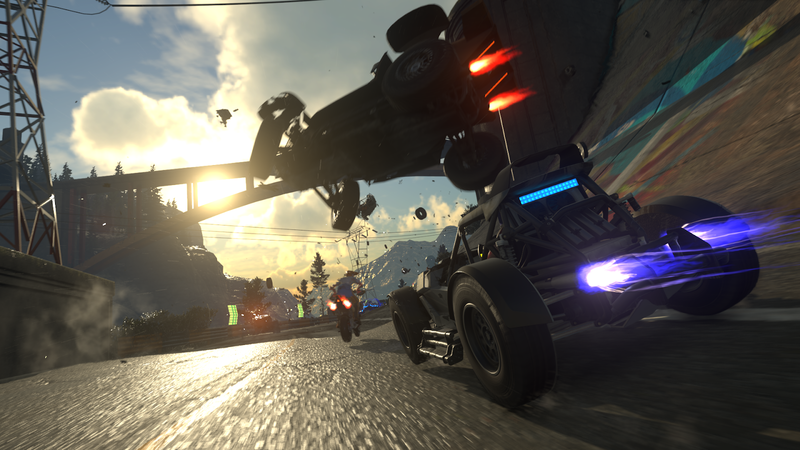 Now sure, we've seen games like Burnout, Split Second, and even games like Blur have certain elements of Onrush in the past. The one main thing missing from Onrush that they all had though is a start and finish line, with this game having modes that see you trying to complete a certain objective (get to these modes soon) as a team to win that event. Teamwork will be key if you want your team to win here, that and also using the right vehicle for the job in hand, or just in general when it comes to having each others back when it comes to the opponents on the track, just dying to take down your fellow teammate if they just happen to be in a weaker vehicle than them. Do all this correctly, and the victories should start to pile up. The game gives you a total of eight vehicles to play with, ranging from bikes to tank like cars known as the Titan and the Enforcer. Each vehicle has three abilities that you can use. with one being what your rush ultimate (think superpower) will do. Another being how you can fill up this boost meter a little bit quicker by doing something like driving near teammates or simply by doing tricks if using a bike. The final one explains what your special ability will do, with this offering things such as giving nearby teammates a shield or dropping boost pickups for teammates when you use your boost. On top of all this, you will also just need to be an entertaining driver as you can be if you want to keep up with the pack. Jumps, tricks, and even taking out what the game calls fodder vehicles (just think of them as boost pickups that drive around the track with you) to keep that boost filled, as you will need it almost every second you play the game. The game offers an offline mode (although it can be played with friends in co-op too, something I never got around to testing sadly) in Superstar, which if you've ever played any sort of racer before, you already know the format. Winning races in this mode unlocks points, those points help unlock further locations with even more events to play. Your goal is simple, just win these events and also try and beat some of the challenges that each event has to claim as many points as you can from it. 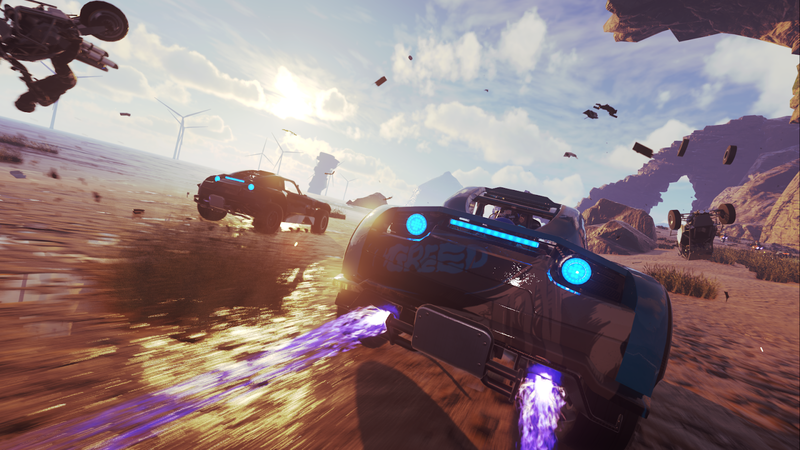 Onrush has four different events when taking the game either offline or online, with a little brief introduction to each of these found below. Overdrive: You and teammates must earn boost and use it to help fill up a bar at the top of the screen. First one to fill it wins the match. Do tricks, jumps, or do it the cooler looking way by taking people down Burnout style to get those points that you need. Chain in together like a pro and those points will come even quicker and help net your team the win. Countdown: Here you have a time BAR on the top of the screen, refilled by driving through gates to help keep these bars topped up. The first team to run out of time loses the round, so PLAY THE OBJECTIVE PEOPLE. Lockdown: In this mode, you have a zone that moves around the track that must be claimed once it goes active. Get in this zone to claim it, do it enough times to win the match. I will be honest here, this is where Onrush might struggle the more time goes on, as while the game is super fun to play as it stands in terms of just getting into any mode and having fun with it now in its early days, I do worry a little that the modes will need adding to the more time goes on to keep it fresh and interesting. I have read that the team are already on the case in terms of getting us some cool stuff added into the game in the future. So I really should just stop worrying and just enjoy what is one of the most fun games I've played this year. In terms of the hook outside of racing about at breakneck speeds and winning events, well that can be found in the gear section of course. Just playing the game to rank up your level will net you a loot box (no real money changing hands here), with gifts inside that include Vehicle skins, outfits for characters, celebrations for that end of screen win, new tricks for the bike, or just a new tombstone which drops when you find yourself implanted into that nice tree or brick wall you thought you could totally avoid. You can also buy these with credits you earn while playing too, but buying them will be a bit harder are they are quite pricey if you fancy picking up the more cooler looking rare items. Overall: While not perfect, Onrush is by far the most fun I've had with a game so far this year. While limited in modes currently, you can't help but have fun with it's fast and furious style of play on offer, and it does all that while still looking great too. I can see myself sticking with this for a while, something I never thought I would say about a racer since my Split Second addiction.